According to FactSet Research, at January’s end, cash and short-term investments held on the balance sheets of companies in the S&P 500 (ex-Financials) settled at a record-high balance of $1.43 trillion (blue bars in chart). The prior record, which was achieved in 2013’s fourth quarter (4Q13), was $1.41 trillion. Net debt issuance is also increasing. In 4Q14, companies issued $89.4 billion in net debt. This figure represented the third highest total for a single quarter in the last 10 years. 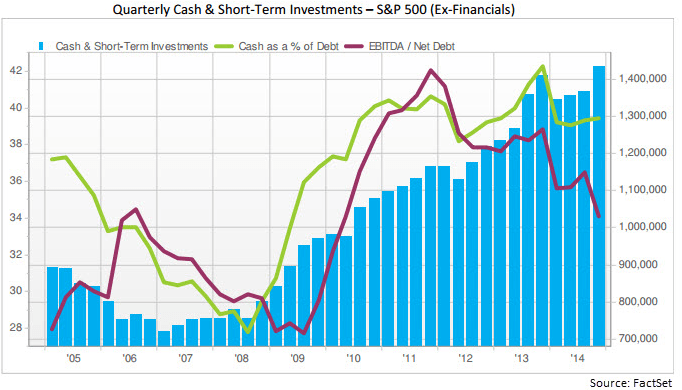 Cash as a percentage of debt was 39.4% (green line) at 4Q14’s end. This percentage was down from the year ago figure of 42.3%, but it was above the 10-year average of 36.1% for the S&P 500 (ex-Financials). This data begs a few questions, including “Why are US corporations holding so much cash?” and “Why are companies borrowing when they hold so much cash?” A big part of the answer is taxes. The general rule under U.S. tax principles is that when a company generates income outside the U.S. and subsequently repatriates it to the U.S., it must pay the difference between the foreign taxes paid on the sum and the U.S. tax rate, which is quite often higher. Many U.S. corporations have based their foreign operations in countries with low tax rates such as Ireland and the Netherlands. This helps minimize the amount of tax owed on earnings generated outside the U.S. Under the applicable accounting rules, if companies deem their foreign earnings to be “permanently reinvested” in their foreign operations, they do not have to accrue taxes on such amounts. Foreign earnings can be used to expand the local sales force, increase research and development spending or even to buy a rival. There are some provisions of the law requiring that interest and dividends earned from cash on hand be taxed currently. However, the low interest rate environment significantly reduces this liability. Some companies remain reluctant to move their money. There is still hope that the U.S. will enact some type of tax reform allowing companies to bring money home more cheaply. Last month President Obama proposed letting companies repatriate the profits they hold at overseas subsidiaries at a 14% tax rate; he also proposed taxing foreign earnings going forward at a minimum rate of 19%. If passed, such legislation could cause companies to return cash to the U.S.; it could also increase tax bills. When analyzing potential and current holdings, we review balance sheets and cash flow statements in detail. If a company carries considerable debt, we review the applicable terms. We also assess both the gross and net debt balances and seek to understand where the cash and short-term investments on the balance sheet reside. Such information can be found in the quarterly and/or annual financial statements (10-Q and 10-K, respectively) and may also be disclosed in earnings releases or on quarterly conference calls. It is also important to assess management’s capital allocation policy, as we believe the ability to allocate capital effectively is one indication of a successful management team.